We would be very pleased to welcome you to the OpenText & fme Life Sciences Usergroup Forum. Use this platform for an active exchange of experiences with other users from the Life Sciences industry. Outsource support & maintenance for your OpenText Documentum applications to improve the quality of your services while maintaining firm control over costs for ongoing operations at the same time. Are you interested in learning how the fme Custom Solution Framework helps you to cut costs , reduces the time spent on projects, minimizes the risk of your project failure and improves quality and user satisfaction? Please get in touch we are happy to arrange a 1:1 web session to explain the concept in more detail, listen to your requirements and answer your questions! OpenText provides one of the most comprehensive and highly-integrated Enterprise Information Management (EIM)platforms, especially since the acquision of the Enterprise Content Division of EMC. The OpenText Documentum powerful suite covers the entire information life-cycle, starting when the information is captured or created all the way through its archival and eventually disposal. During the life of a document the ECM technologies empower user to collaborate, manage access, distribute and control information securely in various ways. Especially when facing huge amounts of data, extended security requirements and the need to integrate existing systems/processes, customers will benefit from the highly advanced capabilities of the OpenText Documentum Suite. fme AG has been a partner for the product Documentum since 1998 and has gained tremendous experience in hundreds of projects. We look forward to your challenge! A solid conceptual design ensures the success of your project! Our consultants will work with you to analyze all important aspects of your Enterprise Content Management project. We identify and document your requirements in a concept and finally translate your requirements into corresponding technical specifications. Furthermore, we help to create schedules and budget plans for system roll-out and operation, end user training and back-up procedures for your valuable information. In an economy increasingly based on knowledge, Enterprise Content Management often provides ample opportunities for competitive differentiation, elevating it to the strategic level of every enterprise. The nature of an enterprise’s ECM approach is of course continuously effected over time by new acquisitions, market re-alignments, technology and product advances. In order to stay ahead of the pack and in order to continue to benefit from your investment, your ECM strategy needs to be critically reviewed from time to time, pinpointing to where it may need adaptation or expansion. This is where our experienced consulting staff can be of valuable assistance to help you gaining that extra competitive edge in your business. Many OpenText Documentum customers face the challenge of selecting a suitable web-based, next-generation Documentum application to replace their old Webtop client. Apart from the clients, D2 and xCP, which offer numerous advantages, there are also various alternative clients available. But how can you replace a Webtop client – which may have been highly customized – with the latest technology? Adopting new technologies can be difficult. Moreover, the fact that the currently available standard clients cannot be customized may pose a particular challenge. The Webtop client offers unlimited adaptability, but the new clients take a strongly configurative approach. Although this approach can significantly reduce implementation costs, it also entails limited adaptability, making it potentially unsuitable for certain types of applications. Our projects have led us to determine that companies view evaluating client technologies as a big challenge. After all, this evaluation involves taking the requirements of both the IT team and users in other departments equally into account – and these requirements often diverge from one another. Our OpenText Documentum Client Strategy Evaluation consulting service helps you select the right client technology for your company! Get in touch with us! We look forward to taking on your challenge. Tailor-made Software Development – As soon as the conceptual design for an OpenText Documentum ECM solution is completed, our experienced team is available to carry out the implementation, no matter if the design was created by us, by your in-house team or by another service provider: fme realizes your wishes. Our implementation may cover the adaptation of your existing systems or a complete new development. Moreover, we ensure that existing systems are successfully integrated and that documents are migrated to the new system on the appropriate date. Our Custom Solution Framework (CSF) helps clients to efficiently implement custom OpenText Documentum based solutions for requirements which cannot be resolved through standard out of the box clients. We are designing a state of the art technology stack, concepts and predefined basic components which can be reused in projects to reduce the effort and costs. In addition to the technology we have a strong focus on usability, performance and maximum flexibility to achieve a high user satisfaction. Each implementation will be individual based on customer requirements but with the help of our framework. With our solution framework we protect your investments into the OpenText Documentum platform. Are you interested in an online demo of our sample implementation? Then we’d be happy to set up a meeting and present you with detailed information on our Custom Solution Framework. Satisfied users and lower operating costs – Once your solution has been successfully designed, developed and tested, it must finally be installed and delivered to the end user. We implement the developed solution and support you, among other things with our competencies in the area of “Human Change Management”, in the successful roll-out. For the long-term success of your systems, we offer you support in the area of maintenance and support – clients like MAN Diesel & Turbo SE already benefit from our nearshore location in Romania, why don’t you too? Your staff may struggle with excessive system response times, costing valuable work hours and placing a strain on your budget. Do you suspect your web application could be used more effectively? Do you deal with data replication in distributed environments? Would you like to know how many simultaneous OpenText Documentum users you could serve at sufficient performance levels? Maybe you are planning a substantial increase in the number of users for your OpenText Documentum application and need to ensure your system can be scaled up accordingly? We have the solution for you! We provide expertise and assistance on how to make your system perform better. As a result you receive documented, professional recommendations for optimizing the performance of your application(s), an analysis of the system’s weak points and an in depth analysis of your OpenText Documentum architecture. The timely elimination of system bottlenecks and the resulting efficiency improvements of your business critical applications may provide you with competitive advantages in todays fast moving markets. dqman is a free administration tool for OpenText Documentum users to administrate, maintain and program the OpenText Documenturm Content Server. The languages DQL and API provided by OpenText offer a wide spectrum of possibilities. With dqMan we provide you with a matching integrated interface which allows you fast and effective use of these languages. Save valuable working time and enhance the quality of your applications. Especially when using a powerful platform like OpenText Documentum a fast and user-friendly access to all important information is essential to your organizations success. OpenText now has developed its new web-based client with strong focus on an effective, user friendly interface, providing a modern and intuitive user experience. The widget and workspace concept accommodates individual working styles of different users – optimized for the current task. At the same time, the use of state of the art Web 2.0 technologies (XML, JSON, ExtJS, Ajax) brings a significant advance in terms of comfort and performance to the new client. Do you want to achieve an amazing user acceptance with the new innovative client while reducing implementation and administration cost simultaneously? Using Webtop or WDK applications, already? We will support you in evaluating which benefits a switch to D2 can bring for your specific solution. Take advantage of our free assessment! With xCP 2.x OpenText provides a composition platform that both, end user and IT department, will benefit from. OpenTexts xCP 2.x solution assists and accelerates all process driven tasks, from loan applications to contracts management to benefits approvals. Business processes are automatized and in manual processes workers are provided with everything they need for the right decision, e.g. charts, related key information and collaboration features. fme AG took part in the early Access Programm for xCP 2.x and was therefore involved right from the start in this new platform. Our employees have gained thorough knowledge of the product and are ready to support you with your xCP 2.x project. With Documentum OpenText provides a basic framework for document management applications for life science companies. The pre-configured, integrated solutions are based on best practices for this industry branch and are available as specific business modules for standardized business processes for the business areas of quality assurance, clinical and non-clinical research, and regulatory issues. We will happily show you how you can reduce your system complexity, lower costs for software licenses and storage and at the same time be compliant with rules and regulations Contact us now! OpenText LEAP are content apps that drive productivity and solve business challenges. OpenText LEAP has an unrivaled set of document classification, extraction, and content transformation tools. A la carte menu options and easy-to- track usage. Pay only for what you use. Instead of wasting time moving to a new platform, LEAP integrates with your front and backend systems with the help of REST, CMIS, and other standard data architectures and service layers. The purpose-built, multi-device ready apps can be configured in minutes so different users can focus on their most important tasks. When both OpenText Documentum and Microsoft SharePoint are running in your organization, the integration of these two content management platforms becomes a desirable goal. There are ways of making the most of what you have already installed, while preparing for the future at the same time. We assist you in developing the very best integration strategy on the basis of different possible scenarios. Together we will identify the most benefi cial integration potential and show the recently gained business value. Get in touch with us! Due to increasing demands of quality and safety standards it is essential for anyone who is planning, constructing, operating or shutting down an industrial plant to maintain reliable and easily comprehensible plant documentation. Be it a plant for process (chemical or pharmaceutical) engineering, a power plant or a plant for industrial manufacturing – missing or incomplete documentation may incur legal consequences under both criminal and warranty law. A plant asset documentation solution reduces liability due to company negligence; it creates transparency, optimizes workflows and may save considerable time and money. The fme group assists utility companies to make optimal use of their document-based knowledge and to better integrate such information into their technical and business processes. This not only assures adherence to compliance regulations, but typically leads to measurable economic benefits. Make an appointment with our specialists! The fme Custom Solution Framework (CSF) helps you to provide the best ECM solutions in terms of usability, performance, and flexibility for the Documentum platform. The framework helps clients to efficiently implement custom Documentum-based solutions for requirements that cannot be resolved through standard out-of-the-box clients. We are designing a state-of-the-art technology stack, concepts, and predefined basic components that can be reused in projects to reduce the effort and costs. Each implementation will be based on individual customer requirements but with the help of our framework. With our solution framework, we protect your investments in the OpenText Documentum platform. Are you interested in an online demo of our prototype? Then we will arrange a meeting and show you our Custom Solution Framework in detail. We are looking forward to hearing from you! fme’s D2 based Contract Management Framework helps clients to efficiently manage their contracts and ensures that they are accurately recorded and audited to meet compliance guidelines. The Contract Management Framework is based on OpenText Documentum D2 – a document management system as backbone. This presents the advantage of providing a »single point of truth«, where the version and lifecycle status of each contract are displayed clearly. Besides, a powerful workflow management engine supports the business processes during the lifecycle of each contract. 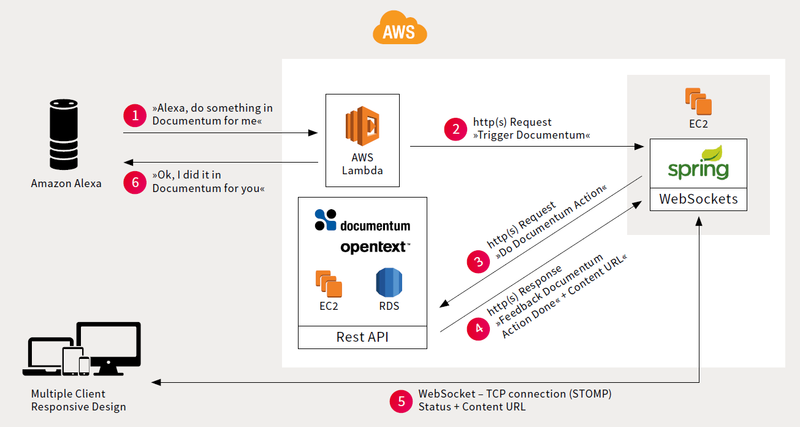 Showcase: Alexa, please open OpenText Documentum! »Alexa, please open OpenText Documentum.« With simple oral commands like these, users of OpenText Documentum can now have the digital voice assistant Amazon Alexa open their documents, have her read them aloud and lately even translate them to other languages in real-time. This is possible thanks to a showcase, which the digitalisation experts at fme used to connect a newly written Alexa skill through serverless services such as AWS Lambda and an interface with OpenText Documentum. The versatility of AWS & Amazon Alexa has enabled fme to develop a service that can be easily adapted to the specific tasks and expectations of user companies. The developers intentionally only used basic functions so that they could design the usage to be as simple as possible. In this way, users can control OpenText Documentum by voice command, navigate through it, display content, or have content read to them. »Alexa could just as easily explain simple tasks in OpenText Documentum to users. We have already thought about an interactive tutorial as well, in which Alexa could walk users through the complex ECB platform,« says Oponczewski. This would not only simplify the onboarding of new employees, but make it cheaper too. In laboratories where gloves are worn and manual control of the mouse and keyboard is difficult, users can, for example, have work instructions from Alexa read out loud.